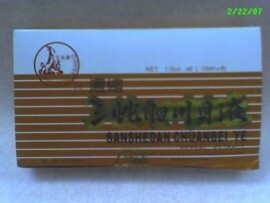 This Sanshedan Chuanbei Ye, also called San She Dan Chuan Bei Ye. Resolves phlegm, clears heat, stops cough. A liquid extract for chronic or acute cough with phlegm, including bronchitis, emphysema,pneumonia or asthma. Valuable for stubborn phlegm. Function: Dispel External Wind and Eliminate phlegm in cases with cough and asthma, tranquilize heart disharmonies which have led to mania, uneasiness, hysteria or epilepsy. Application: Use to treat Wind-Heat OPI which has affected the Lung. Symptoms: High grade fever, cough with expectoration, sputum, asthma, problems breathing, chest fullness, chronic cough with stubborn phlegm (white or yellow); and chronic tracheitis with cough sputum, asthma, acute pneumonia, acute bronchitis, and whooping cough. Use to treat heart disharmonies which have led to mania, uneasiness, hysteria (in excess condition, only) or to epilepsy including grand mall or petit mal seizures; even very small ones (in Excess condition, only). This herbal medicine may be taken with other seizure medications such as phenobarabitol or dilantin. Contraindication: Do not use this formula with patients who have a def. syndrome; use only with patients who have an excess syndrome. Box of 6 glass vials, each 10cc. Directions: For adults, to be taken one vial twice daily and half for children when needed.